The self-knowledge gained from yoga has been evident to practitioners for many generations. Chances are great that your direct experience of mental calm, physical relaxation, strength, and spiritual centeredness has been clear and valid testimony as to the benefits of the yoga practice throughout your life..
Research accumulates weekly supporting the firsthand testimony of all ages of yoga students about the impact of yoga on mental wellness. Three examples: the readily accessible book Yoga as Medicine by Timothy McCall M.D, reviews scores of studies about the healing impact of yoga on anxiety, panic attacks, and depression. Prenatal yoga has been proven to combat depression, decrease stress, and manage anxiety. This important study reviewed key components of yoga intervention for depression and anxiety. In all classes, we take a pause from the physical practice for calming and meditative breathing. Here my prenatal yoga student allows her mind to settle. My wonderful student Ken was willing and brave enough to allow me to share his yoga experience as an adjunct support for his mental health treatment. Ken was diagnosed with bipolar disorder a number of years ago. Bipolar disorder is a mental illness characterized by shifts in mood from periods of extremely high energy levels to strong depressive episodes. Additionally, Ken suffered from anxiety disorder. Anxiety symptoms included the constant presence of worry and mental disquiet. Acceptance of these conditions was one of the greatest tests of Ken’s life. Yoga has helped Ken manage his bipolar disorder and bring balance to his life. Ken’s days had been fraught with difficulty. At one point he took it upon himself to skip his medications, completely against the treatment plan of his psychiatrist. The result was that Ken suffered from a devastating psychotic break. Weight gain turned out to be a major side effect of his disorder: at one point he weighed 313 pounds. Ken decided to try yoga. Ken is wholly drawn to yoga body, mind, and breath therapeutic and self care practices. Through the experience of deep relaxation and conscious sedation that I introduce in class, Ken created mental positive intentions, known as sankalpas, to inform and guide himself to healthy mental states and self acceptance. With the support of his psychiatrist, Ken has learned to manage his bipolar disorder, and he is clear that he must continue the bipolar medication regimen to stay stable. 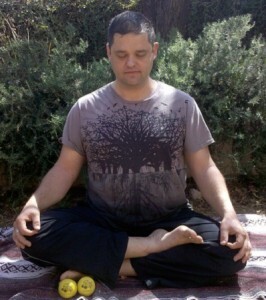 At the same time using the self-care tool of yogic complete breath in everyday life, he manages his anxiety disorder. Ken has actually stopped a potentially devastating public anxiety attack! Last month, Ken shared the wonderful news that his psychiatrist has given him permission to completely cease his anxiety medication. All of us face stress and overload from everyday living. As Ken has demonstrated, these challenges can be managed. Yoga has been an empowering adjunct treatment for Ken’s mental wellness. A warm welcome to class. Latest updates on my schedule are here. A version of this article was originally published on YogaTuneUp.com.